This Beach Front Condo #306 is located on the top floor with an ocean view to die for. 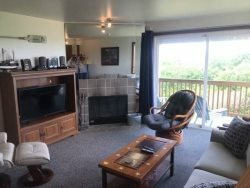 1 bedroom, full kitchen, full bath, living area with Cathedral Ceilings, wood burning fireplace (presto logs only) and a TV with a DVD player. The bedroom has a queen bed and the living room has a queen sleeper sofa. No pets & No smoking in rooms or on balconies.